Symach in December has moved into new premises of 160,000 square feet in: Via Bazzane 69 – Calderara di Reno (Bologna) Italy. From March will be open also the new showroom and training center of 20,000 square feet which will be installed in all the products in operation, including the FixLine SprayTron 10 paint jobs per day and FixLine KombiTron 20 paint jobs per day, in addition to FixStation for one panel repairs and the entire line of ShopLine furniture for bodyshop. 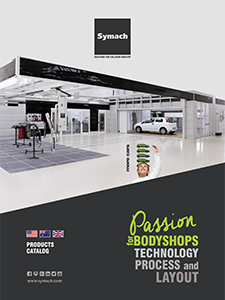 Symach, operating directly in the world, is a leader in the construction of new body shops; by designing the repair process, the layout, taking care of the directly installation and training for the technical staff and managers of the client, to achieve the performance of; organization, productivity and fast key to key time, unique feature of the FixLine repair process.